It was my sisters 13th birthday and she had a costume party. There was no theme really but my friend Laura and I wanted something completely different. We had loads of ideas of like Barbie and Ken Robbers fairies but they were rubbish ideas. 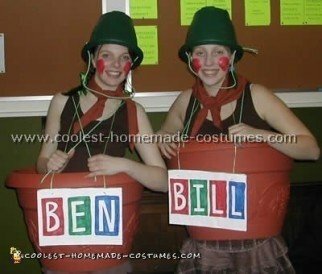 So after looking on the internet for ideas we thought of Bill and Ben and knew just how to make it. We both had brown tops skirts and boots so that was a start and we had seen some massive plant pots. We cut the bottom out of the plant pots so we could get into them and made holes where garden string ( thought we’d carry on with the theme) would hold up the pots over us as though they were tops. When thinking of makeup and headwear we decided to paint on rosy cheeks and have green eye shadow. This made us look gardenier. Then on our heads we wore plant pots as hats.